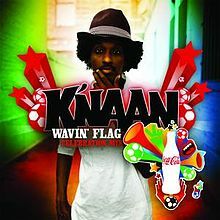 We all remember the song "Waving Flags" proposed by the Somali-canadian singer K'NAAN for the 2010 FIFA World Cup. The song was promoted by Coca-Cola and it is a call for people to seek their freedom. The song get several versions, singed by will.i.am or David Guetta for example. I was a great heat, reaching a good position in all charts around the world.